Welcome to the Art Glitter/Dreamweaver Stencil Cross promotion month. We have paired up with this wonderful company to show you how our glitter can be used with these beautiful and detailed stencils. All of our designers will be using the Double Glitter Technique! Make sure and check out Dreamweaver Designers every Thursday! Play along all month with this fun challenge. Make sure and LINK to the Dreamweaver site to be eligible for 1-of-4 prize packages featuring stencils and glitter! You may even get your creation featured on Art Glitter’s Blog! Hope everyone will play along with this fun challenge. If you don’t know how to do the Double Glitter Technique please head over to http://www.youtube.com/watch?v=Foyo09lKpw4 to see Lynell Harlow demonstrate. 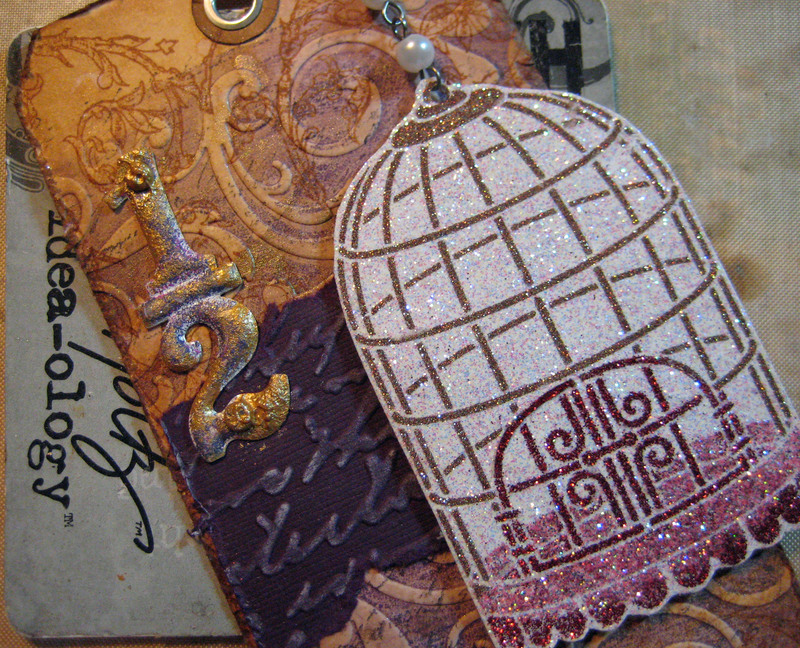 I’m working through my Dreamweaver Stencils that I ordered for this Art Glitter/Dreamweaver Double-Glitter technique and came to the birdcage. Wasn’t sure how I was going to use it but here’s what I ended up with. I used the double-glitter technique with lots of masking. 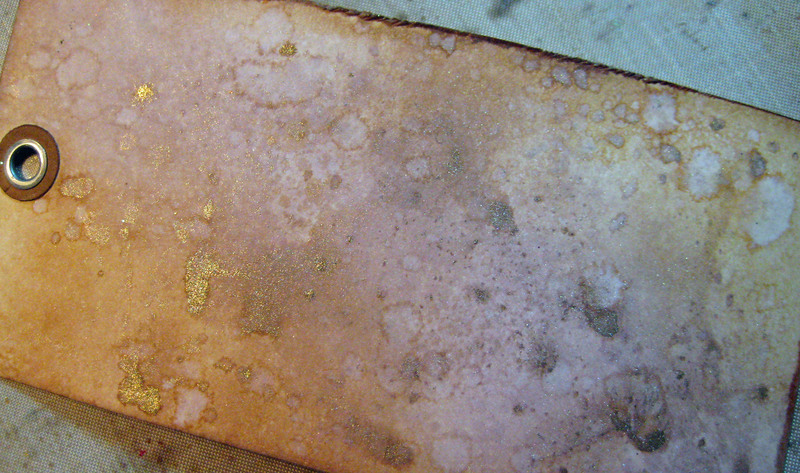 You can learn more about masking by hopping over to my post on the Art Glitter Blog today. What I’m going to do here is walk through the process of making the completed tag. 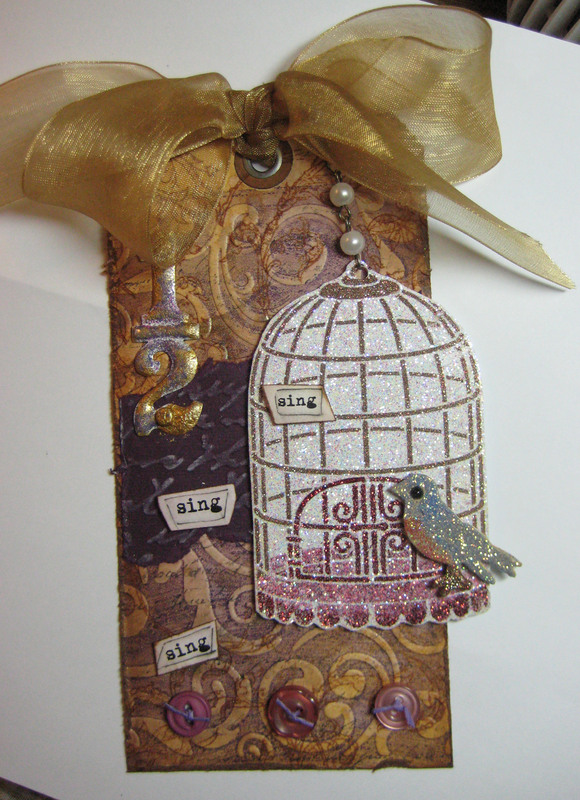 After glittering my birdcage using Dreamweaver Stencil LL3012 Birdcage I tried to use it as a card element but it was too stuffy. 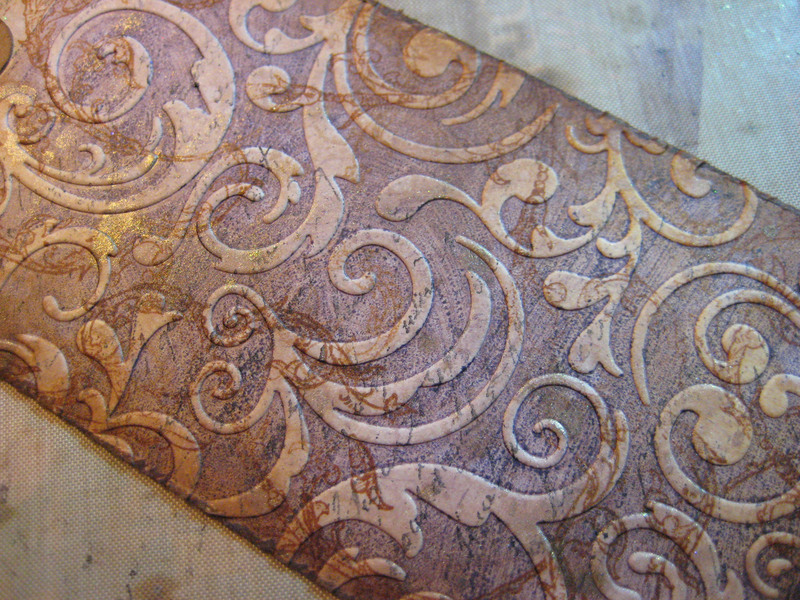 I debated for about an hour – or more – whether to cut it out or not and just use it on a tag. 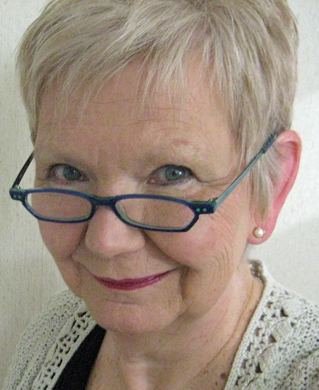 I decided to pick up the scissors and have a go at it. I was so happy I did! I inked a tag with Milled Lavender and Tea Dye Distress Inks from Ranger then mist it with my homemade concoction of Heirloom Gold Perfect Pearls and water mixed in a Mini Mister. Let the colors run a bit and heat set to stop the action. The flourishes are Clear Art Stamps set No. SM29 Birds at Home from Crafty Secrets and stamped with Ranger’s Sepia Archival Ink. Then I over-stamped with a script stamp from Wendy Vecchi, LCS038 Live and Make Art using a dry pad of Jet Black Archival Ink to get a faint stamping of the words. To create even more texture and depth (it was still too flat for me), I inked Cuttlebug A2 Victoria embossing folder with the Milled Lavender Distress Ink, placed my tag inside and embossed it. Tell me you don’t love the results! There’s also a small piece of deep purple cardstock in here that is embossed with Cuttlebug A2 Script Texture embossing folder then inked slightly with a Staz-on Opaque White ink pad. I played around a bit (several hours) with the layout before it finally started to come together. 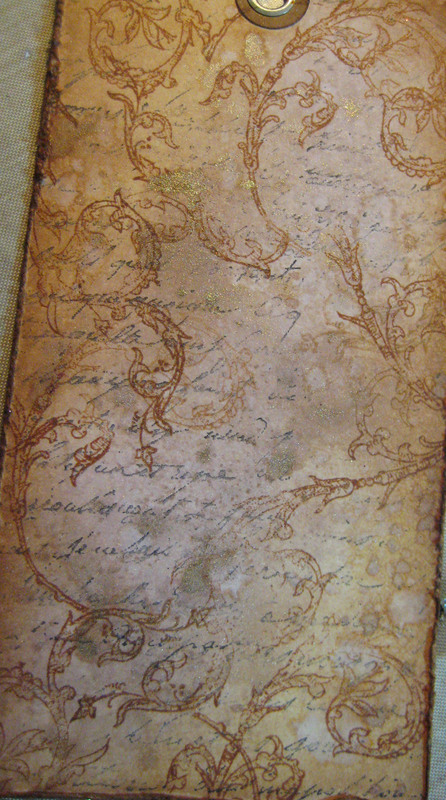 The 1/2 is from Tim Holtz Idea-ology and it’s painted with Ranger’s Adirondack Snow Cap White, Cranberry, Eggplant and Gold paint dabbers to create the nice patina. Because it’s a birdcage it needed a bird in there somewhere. The bird charms were not working for me so this guy is cut from chipboard with the Tim Holtz Mini Bird and Bird Cage die. His eye is a gem that is glued on first, then to bring in the several colors of glitter on his body I painted sections with Designer Dries Clear and just dipped him into the glitter jars of Tree Bark Microfine Opaque (524), Juicy Fruit Ultrafine Transparent (99) and Nirvana Transparent (97). There is Wisteria (106) and Boysenberry (257) Ultrafine Transparents and Red Velvet (155) Ultrafine Opaque and Iris (710) Microfine Transparent used for the bird cage. The cage is popped up with dimensional foam squares and hangs from a beaded chain by 7 Gypsies; the words are printed then outlined and inked lightly with Milled Lavender and Tea Dye Distress Inks. I added some buttons at the bottom and used Karen Foster Floss in them. They’re glued on with Designer Dries Clear. I finished it off with a beautiful piece of gold ribbon. The color in this tag is just amazing and the photo just doesn’t do it justice. Don’t forget to hop on over to my post on Art Glitter’s Blog today to see how the double-glitter technique is done with masking. Your tag creations with the DW/AG collaboration are fabulous! Love all the details. Beautiful!! I love the technique you used with the embossing folder and the Milled Lavender ink pad! I always learn something new from your blog. Thank you Donna! I hope you give some these techniques a try and let me know how it worked for you. Great tag! Love the patina on the 1/2!!! Thank you Robin. I love making patina! The tag is so beautiful Linda. Just love all that layering. Thank you Sherry! Hope you’re having a crafty-good summer! The bird is so cute! Thanks Candy! He was so easy to do to!